Vintage Motorcycles restores and sells vintage motorcycles of all types and from all eras. Top quality NOS parts are used whenever available. After market parts are used as needed. I pride myself on my incredible attention to detail. 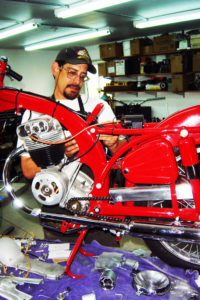 Several outstanding craftsmen partner with Vintage Motorcycles, in order to provide full-service machine shop work, body work, custom painting, and welding, as well as, Vintage Motorcycle’s full engine work. Copyright ©2019 Vintage Motorcycles. All rights reserved.